inspirational tags she created on the TT blog. recycled black card from an old calendar. I am also linking to Go Tag Thursday, tag it. won by Lisa and Eileen. Eileen, I need your snail mail addy, please. lemon muffins - help yourselves! The tags came out beautifully! Great recycling idea too! It is getting too cold here too for the outside. Your lemon muffins look so yummy. I am sure they got devoured! I love the clock decor. So cute. They all move every hour, it's fun to watch! Fantastic steampunk style tags, super rusty colour shades on the first one. Packaging is so useful, like you, I can always find a use for it over time. Great photos, you caught super shots of the rain pouring down. I really liked the clock tower as well, it looks like the figures up there move? Your cakes looked delicious, I think your visitors may have eaten and enjoyed them all. Happy Tea day wishes Valerie. 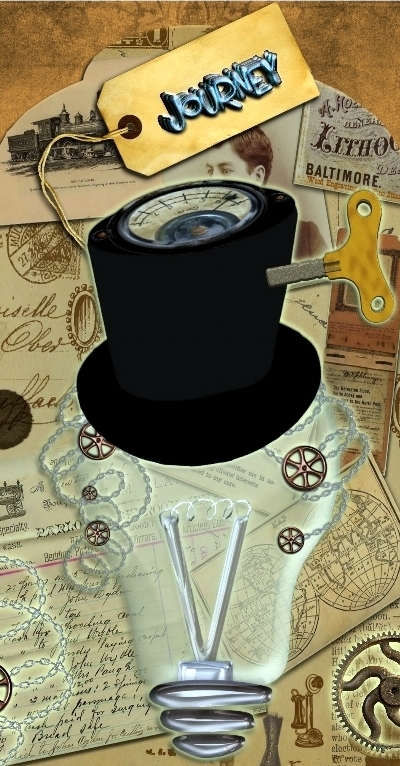 Gorgeous steampunk artwork Valerie, a favourite theme of mine too. The muffins do indeed look yummy and your photos are fab as always. I never really got into steampunk, but I am starting to understand it, especially with the two beautiful tags you created. They are exactly as I would expect steampunk to be. The clock in the town of Neuss is fabulous. Loved the figures that moved on the clock. I also enjoyed the arched door with the very expressive figures. So glad you had company so I can have one of those muffins. 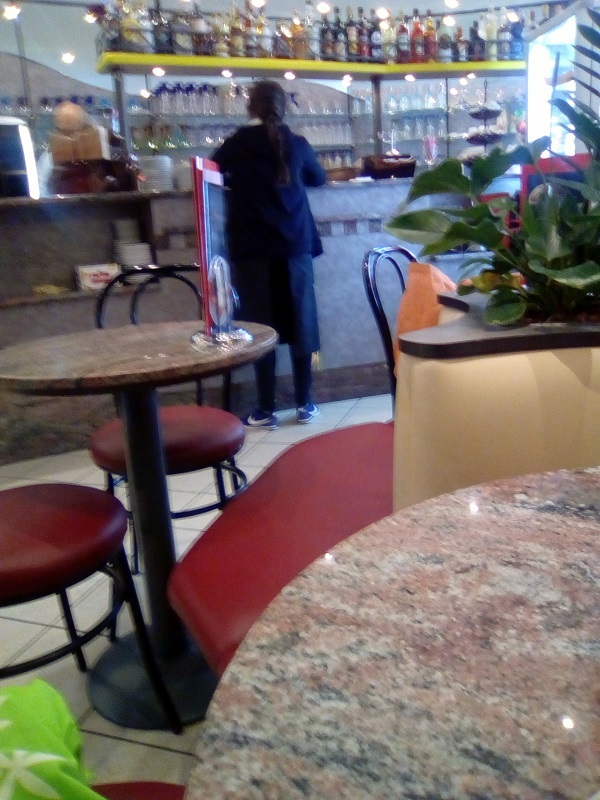 It was good to see you were enjoying your cappuccino inside the ice parlor because the rain and cold weather are really not conducive for sitting outside. BTW, those rain shots were incredible. Thanks for sharing your beautiful steampunk tags, your trip photos to Neuss, and your muffins and cappuccino with us for T this Tuesday. Such clever artwork as always Dear Valerie! Such a lot of rain, coming down in bucketfuls!! cute tags. The coffee must've been good! Perfect muffins, yum! Love the rain shots and enjoyed the remaining photos of Neuss. Yum, those lemon muffins (my favorite) look great. Thanks also for the tag ideas. I especially like the recycled materials that you included in your first tag. Happy T Day! And Neuss- oh how I'd LOVE to see that building in the first photo especially. Happy T day! Yes, it is really beautiful. Lovely tags! I love those steampunk birds with the stitching. Your tags are fabulously steampunk and neutral. Beautiful! das sind ja tags wunderschön an zusehen und grossartig die Ideen wie du sie gemacht hast! Lecker die Muffins und bei dir hat es Bindfaden geregnet! Nah und Neuss mit den Schützenfiguren das ist immer interessant wenn sie bewegt werden, daneben bin ich immer zu einem Doc gewesen im Haus. Schönen Tag und hoffentlich mal was ohne Regen bei dir! More great photographs of another interesting place. Fabulous tags, yummy muffins and lovely photos. A fab steampunk tag (Yes, I also keep my Amazon envelopes for crafting) and the digital one is great too. Thank you for sharing the photos from Neuss. What a beautiful place. I love the clock display. I assume it moved and has a caroussel. That must be quite a spectacle. Yes, I'd love a lemon muffin, thank you. They look delish! I forgot to tell you that I love the sandcastles in your banner. Great! I love them. We have a friend who is a artist but does sandcastles in the summer to earn a bit on the side. Lovely art,delicious looking muffins and great photos today! Have a nice T-Day! good morning, beautiful post as always-I enjoy all of your photos. 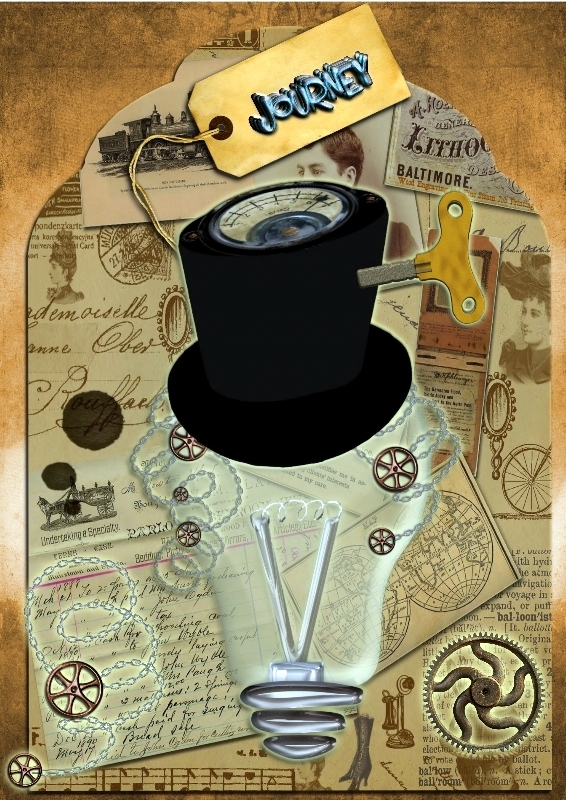 Your steampunk art tag is amazing loved reading about all of the element in it. I also loved your next tag with the cup too. OMGosh, look at that figurines-clock. How amazing. I don't usually eat breakfast, but I'm definitely having one of those tasty-looking lemon muffins this morning. Thx :) I love that clock! What fun it must have been to watch. You got good pics of the rain. We're still having summer heat and sunshine here. Your tags are fabulous - love the birds!! And the large lightbulb!!! I want to go to Neuss! And very nice art. Love the brown tones. Those lemon muffins -- I love lemon. Anything lemon. This looks excellent! Oh wie schön sind deine Tags, diese steampunkigem Tauben sehen super aus und dein digitales Werk finde ich auch ganz toll zusammengestellt. Die Glühbirne scjimmert so schön und sieht richtig plastisch aus. Dein Sandkunst Header finde ich sehr dekorativ, super Idee! 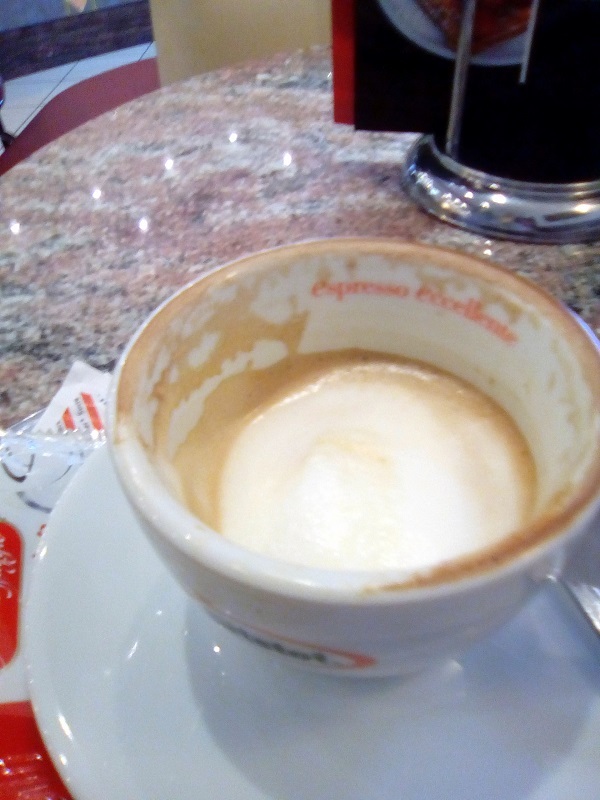 Cappuccino habe ich vorhin auvh nochmal einen in det letzten Abendsonne Draußen genossen. Vorher hatten wir nich einen schönen Spaziergang gemacht. Jetzt backe ich gerade ein leckeres Früchtebrot. Your Steampunk tags are great. Neuss looks beautiful. Love the stonework around the door. The muffins look yummy! The clock is super cool too! I love the figures. Thank you for commenting on my blog. I appreciate your kind words, Happy t day! What beautiful tags! I enjoy your art so much. Your photos are amazing too, thank you! Your tags are perfectly steampunkery! heehee I think i just made up that word! Love your photos from your trip and those muffins- oh my ! Bet they were as delicious as they looked! yummy!!! Once again a wonderful mix for us to enjoy. Nice to see the rain, sometimes it is so welcome! I love your art pieces! They are amazing! Can I have some lemon muffins please! I love lemon! Cool pictures! Love the rain ones! Our temperatures have went the other way! We are hotter now, then it was in summer! Crazy! Big Hugs! Lovely post - the tags are also superb. Love those images.